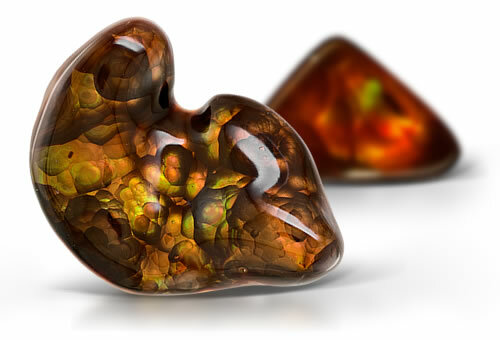 Fire Agate is one of those gems whose beauty and appeal is hard to describe with mere words. A phenomenal gem, it is an opaque variety of chalcedony that exhibits a colorful iridescence. The iridescence is caused by layers of silica and iron oxides, which interfere with the passage of light. Diffraction causes the colorful metallic hues that make this gemstone a favorite of collectors. Its brown body color is also a result of the iron oxide content. Gem quality fire agate is by far rarer than diamonds, emeralds or rubies and is as colorful as any precious Australian opal, although it is typically sold at a fraction of the cost. The iridescent effect is caused by light bouncing off the limonite and goethite inclusions. Fire agates iridescent colors and botryoidal growth structure make it distinctive.